Invited by Hsinchu Centennial Imaging Art Festival, LaptopsRus “MEETING | REUNIÓN” is an open public meeting of women live performers setting inside an electronically updating boxing ring installation. Meeting as performance, Reunion as tournament- women with laptops playing with or against each other in collaborative and challenging ways, “MEETING | REUNIÓN” is presenting an innovative form of live audiovisual performance for the first time in Asia. LaptopsRus, in associate with Museo Nacional Centro de Arte Reina Sofía, presents “Generation Laptop Real Time” mini-conference. First Launching at Vision’R in Paris 2009, LaptopsRus with its open-call-VJs / Live performers has been touring live performances in various art festivals in Europe. This time, LAPTOPSRUS is going to present a special “WIND” edition for Hsin Chu, known as a city of wind, where Autumn wind transmitting elements of growth, vitality, energy, speed, friendship, revolution & woman power. The event invites Taiwan local and international woman live performers to expand the theme “WIND” with their own visual/moving image interpretation. 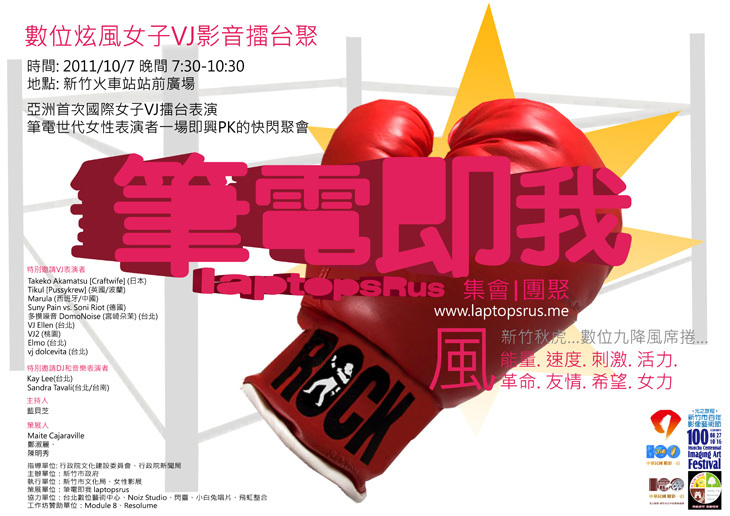 Besides the main event of the tournament, LAPTOPSRUS also holds a three days AV live performance workshop at Image Museum of Hsinchu Culture Bureau. Introduced by LaptopsRus’ two directors, Maite cajaraville and Shu Lea Cheang, the workshop welcome students and the practitioners in beginning and advanced skill levels. In the way of sharing and exchanging with the artists, basic skills of Video/Audio mixing and the contemporary trend of VJ technology will be introduced in the workshop. Along with introducing and building up the LaptopsRus’ woman live performers’ network, a presentation on the history and current practices of the AV live performance will be introduced in this AV live performance VJ workshop. ” LaptopsRus ” team of two chief planner Shu Lea Cheang and Maite Cajaraville, will introduce digital video and audio performances (AV Live Performance) in the past and current situation of development, including ” LaptopsRus ” female digital video artists network.